We all say we love Halloween for the spooky costumes, crazy parties and horror movies, but we know that without candy, there would be an empty void in our heart. 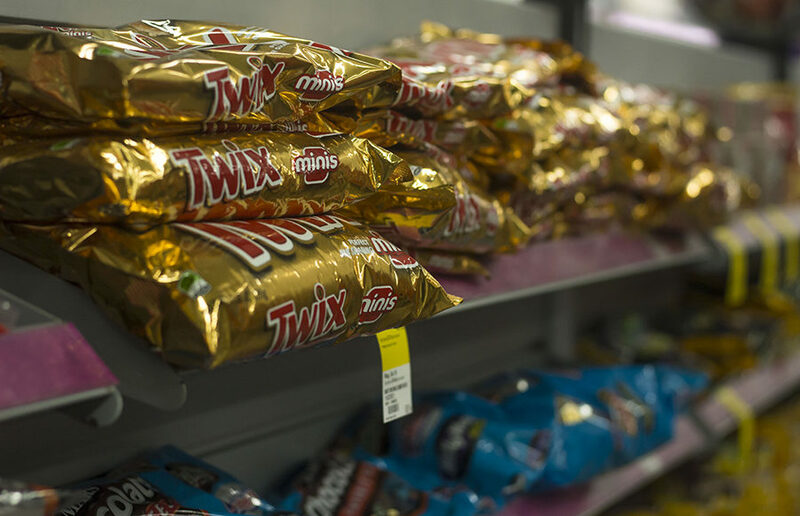 Hershey’s, Reese’s, Twix — we don’t discriminate on this glorious holiday, we want it all. We buy candy to give out at our kickbacks or munch on with friends, but there’s always a big stash left over — a sense of pride as a child and a sense of shame as an adult. After a while, unwrapping and eating every fun-sized Snickers becomes a monotonous task. But what else do you do with all of that sugar? You can turn them into traditional desserts with a Halloween twist. This recipe is a fun take on cheesecake that’s not only easier to serve and eat than a regular cake, but also more flavorful. If you’re not buying pre-made crust, begin by mixing butter with sugar and cornstarch and then salt and flour. Prepare a cake pan by lining it with parchment paper and press the crust dough into the pan. Bake for 20 minutes at 350 F.
While the crust is baking, prepare your candy by unwrapping your caramels and Twix bars and chopping them up into cubes. When your crust is ready, immediately sprinkle the caramel and Twix pieces evenly on top. For the cheesecake, you will need to mix cream cheese with eggs and sugar. Once mixed, add in chocolate chips and pour the mixture over the crust and candies. Sprinkle the Rolos on top of the cheesecake. Bake the cheesecake bars for 30 minutes at 350 F, and let the bars cool before cutting. Even though it’s fall, it’s still uncomfortably hot, so sometimes turning on an oven just doesn’t sound fun. Since this pie requires no baking, you can eat it way faster, and it only requires five ingredients! Once again, if you’re making a homemade crust, begin by mixing your graham cracker crumbs, sugar and melted butter. Press your mixture into a pie plate and bake for about 7-8 minutes at 375 F. Let the crust cool for about an hour. Next, melt your Snickers with peanut butter and heavy cream in a small saucepan on low heat. Once melted, remove the mixture from the heat and let it cool to room temperature (can take up to 20 minutes). Once cool, fold in 8 ounces of Cool Whip and pour this mixture onto the graham cracker crust. Cover the pie with plastic wrap and freeze it for 3 hours. When you’re ready to eat it, top the pie with 4 oz of Cool Whip and add chopped Snickers as a topping. These bars are fast and easy to make and don’t need an oven (two in a row?!). I love unique twists on Rice Krispies treats, and these bars are just that, because they use peanut butter rather than marshmallows as the glue. And for an added bonus: They’re vegan and gluten-free — up until they’re topped with Kit Kats. First, line an 8-inch square pan with aluminum foil and spray it with cooking spray. Then, set the pan aside. In a large bowl, mix peanut butter, corn syrup and the sugars, and heat the mixture on high for around a minute in the microwave. After it has been heated, stir the mixture and repeat the process for one more minute. Once fully melted, stir in the vanilla and 3 cups of cereal. Next, pour the mixture into the prepared pan and pack it down firmly with a spatula. Then, set aside. For the chocolate topping, dice up the Kit Kats and set aside. In another bowl, combine the chocolate chips and peanut butter. Heat on high power for one minute to melt the mixture. Like the previous mixture, stop to stir and continue to heat it up in 15-minute intervals until the mixture can be stirred smooth. Stir in one cup of cereal and pour the chocolate over the base. Pack it down firmly. Now, place the Kit Kats in even rows over the surface and lightly push down on the pieces to make sure that they stick to the base. Cover the pan with a sheet of foil and place it in the fridge for at least three hours before serving. Who doesn’t love thick, dense, fudgy, caramely candy-bar-stuffed brownies? No one. That’s what I thought. Now that we all agree, let’s get straight to this freakishly good recipe. First, preheat your oven to 375 F. While the oven heats up, melt butter in a small saucepan and stir in cocoa and vanilla. Transfer the mixture into a large bowl and mix in eggs, sugar and flour. Pour half of the batter into a pan lined with foil and add chopped Milky Way bites on top of the batter. Then, pour the remaining batter over the Milky Way. Bake for 30-35 minutes and drizzle the brownies with melted caramel when they’re ready. Allow them to cool completely before serving and eating. Some foods are just meant to be together, like bacon and eggs or pancakes and maple syrup. But there are very few combinations that beat chocolate and peanut butter. There’s just something about this perfect flavor pairing of sweet, creamy chocolate and salty peanut butter. First, preheat your oven to 375 F. While it warms up, combine the flour, salt and baking soda. Set the dry mixture aside. Then, mix the butter, sugars and peanut butter until a fluffy consistency has formed. Once mixed, beat in the egg, vanilla and milk. Simply add the dry flour mixture to the wet ingredients and stir until a dough forms. Shape the dough into 36 balls and place each ball into a mini muffin pan (a regular baking tray works too). Bake the dough for about 8 minutes. After, remove them from the oven and quickly press a mini Reeses peanut butter cup into each ball. Let the cookies bake for 3 more minutes. Let the cookies cool for about an hour before removing and eating. This Halloween-style fudge is simple to make, but impressive to look at. You can make it using any candy on hand, but for this specific recipe we’ll be using milk chocolate morsels, butterscotch morsels, Oreos, candy corn and m&m’s. Prepare your pan by lining it with tin foil and grease it with a tablespoon of butter. In a small saucepan, heat the milk chocolate, butterscotch and sweetened condensed milk over medium heat until the mixture is melted. Constantly stir the mixture until it’s smooth and then remove the mixture from the heat. Add the crushed cookies and candy corn into the chocolate mixture and pour it into the prepared pan. Then, immediately sprinkle it with M&M candies. Cover the pan with foil and chill it for about 3 hours, until it’s firm. When the fudge is ready, remove it from the pan and cut it into bite sized pieces. Even if you’re putting your whisks away until Thanksgiving or you’re worn out from baking too much banana bread, you’ll not regret using your candy to make these epic desserts. Contact Dorsa Moslehi at [email protected].